We began our history by noting the particular difficulty that arises when one attempts to write the biography of a concept that is now often dismissed as redundant, old-fashioned and silly. And we have ended our long history with the work of Marie Bonaparte, perhaps the first and last woman to take frigidity with entire seriousness both as a theoretical concern in psychoanalytic knowledge, and as an explanation of her own sexual and social frustrations. That frigidity was a difficult concept for women to engage with was fully apparent as Bonaparte struggled to reconcile her sense that clitoral pleasure was unavoidable and necessary with Freudian suspicion of it as a phallic sign of regressive pleasure, one that women needed to abandon for the sake of sexual maturity and social belonging. That is a logical place to conclude our book. It was the moment in history when the idea of frigidity was brought to bear on the new social expectations of women, and it was the moment when frigidity failed to prove its usefulness. 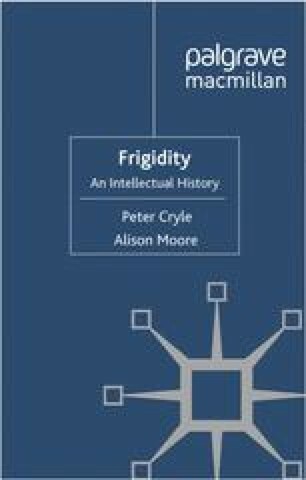 For most feminist thinkers after the Second World War who deigned to consider frigidity as a concept, it was clear that the matter had been settled. Women’s pleasure followed patterns different from those that medicine, psychiatry and psychoanalysis had imagined, and frigidity was one of the sites at which misapprehension of the feminine ‘dark continent’, to use Freud’s expression, was now most clearly apparent.